Roemex Production Chemicals provide quality products, designed specifically for our customers field requirements by our in-house technical specialists. Our chemicals provide economical, cost effective solutions which allow increases in productivity, cost reductions and HS&E benefits to our clients. We pride ourselves not only on the chemicals we design, manufacture and effectively apply in the field, but on our commitment to customer service through continuous evaluation and improvement of our processes, products and services. ASPHALTENE deposits can be found wherever incompatible hydrocarbon streams mix and are also commonly found in the wellbore and near-wellbore region around the bubble point. Roemex can offer a selection of asphaltene inhibitors for continuous injection and dissolvers for deposit removal. BIOCIDES reduce the occurrence of bacterial populations, which can cause reservoir souring, biofouling and corrosion problems. SCAVENGERS remove harmful components from the produced fluid and injection fluid streams. Roemex can offer hydrogen sulfide scavengers which can remove H2S from gas, oil and produced water streams. Roemex can also offer oxygen scavengers which are typically used to remove oxygen from injection fluids but which can also be used in Hydrotest and drilling applications. DEPOSIT REMOVAL Roemex is able to analyse oilfield deposits and advise on chemical methods for removal. Demulsification is a general term used to describe the separation of water from crude oil. As crude oil is produced from a reservoir it tends to become mixed with either natural formation water or mixed formation and injection water. This produced mixture of crude oil and water is termed an oil and water emulsion. It is critical to topsides process operations that the crude oil is efficiently and quickly separated from the water to allow dry oil to be exported and clean water to be discharged within consent limits, thus maximising crude oil value and minimising operating costs. The most common method of breaking emulsions is with the use of demulsifying / desalting chemicals. The speed and efficiency at which this occurs can be improved by process equipment design and operating conditions e.g. increasing the temperature, separator design as well as by selecting the most appropriate demulsifier. Demulsifiers are generally injected on a continuous basis upstream of the 1st stage production separator but in certain circumstances they can be injected subsea. Demulsifier selection is best performed on live crude oil; the selection process must be performed in the field and is generally performed using the “bottle test” method. Using this method numerous base chemicals can be tested on fresh emulsions and at the exact operating conditions resulting in a product that is specific to the field and the emulsion. As field conditions change over its lifetime it is essential to optimise demulsifier performance on a regular basis. Roemex has the capability to perform demulsifier bottle testing both in the laboratory in Aberdeen and also in the field. The bottle test kit comprises a wide range of demulsifier bases from many manufacturers and covers all the widely used chemistries along with some more novel raw materials. Experienced laboratory staff use these chemistries to formulate effective demulsifiers and deoilers and are qualified and suitably proficient to oversee the deployment and performance monitoring of these in the field. Roemex’s range of demulsifiers consist mainly of complex blends of various intermediates formulated to produce a definitive finished product tailor-made to aid the separation of crude oil and produced water at the optimum dose. Demulsifier selection by Roemex is normally carried out in the field by our highly experienced bottle testing engineers. The demulsifier bottle test for product selection is designed around the dynamics of the fluids passing through the separation system. A wide selection of demulsifier chemistries are screened, both on their own right and in blends. Where possible, Roemex will screen more environmentally benign demulsifier bases as and when they come available. Produced water discharge throughout the world is regulated to ensure that minimal amounts of oil enter our oceans and waterways. Effluent water from production separators typically contains 100 – 800ppm oil, depending on the effectiveness of the separator, demulsifier and residence time of the system. Current UK legislation sets offshore disposal at 30ppm maximum oil in water, with some operators setting their own standard to 30ppm. It is therefore necessary to ensure that the oil in water emulsion, which remains after crude oil and water separation, is resolved prior to overboard discharge. In addition, if produced water is to be re-injected into the reservoir it is important that any solids present are removed in this water treatment stage. Both mechanical and chemical methods aim to coalesce the oil suspended in the water by either flocculation of the oil droplets (grouping the oil droplets in to a loose association) or coagulation of the oil droplets (making the size of the droplets bigger). Selection of Deoilers is performed using an in-field bottle test similar to that used for demulsifier selection. Fresh produced water samples are used to test numerous base chemicals under exact operating conditions. The exact test employed will vary dependant on the process equipment present. Where possible Roemex will screen more environmentally benign deoiler chemistries as and when they become available. The method of deploying deoiler chemicals is dependant on whether water is discharged directly overboard or whether the produced water is collected in slop tanks prior to discharge. If water is discharged directly, then chemical addition would normally be downstream of separation and upstream of any water treatment vessels. If water is retained in slops tanks prior to discharge then chemical addition would generally be downstream of water treatment vessels and prior to slops. Roemex perform routine oil in water determinations of produced waters by solvent extraction and IR analysis utilising an InfraCal TOG/TPH analyser. Roemex’s range of deoilers consist of a wide range of various polymer chemistries formulated to produce a definitive finished product to aid the removal of the oil droplets from the produced water at the optimum dose. Gas and water are produced as a by-product of crude oil production, which leads to the possibility of corrosion of process materials. The mechanisms of corrosion can be initiated by electrochemistry, poor biological control and erosion. The corrosion of topsides equipment, pipework and subsea pipelines and equipment can be controlled chemically by the addition of a suitable corrosion inhibitor that forms a protective film on metal surfaces. Most process pipework and vessels are usually manufactured from mild steel and various types of corrosion can occur, including general corrosion, localised corrosion and galvanic corrosion. Roemex have a dedicated corrosion laboratory, equipped with state of the art test equipment which allows corrosion tests to be carried out using a variety of techniques, including Linear Polarisation Resistance (LPR), DC techniques as well as Electrochemical Impedance Spectroscopy (EIS). This enables the development of highly robust corrosion inhibitors that can give general protection from corrosion or inhibition against specific problems, such as weld corrosion. The majority of the laboratory screening work carried out in the Roemex Laboratory in Aberdeen using electrochemical corrosion tests which utilise Applied Corrosion Monitoring (ACM) Equipment. Roemex have ACM Gill 12-channel potentiostats for use in electrochemical corrosion screening tests. This computer-driven facility is equipped with a wide range of techniques, including Linear Polarisation Resistance (LPR), Zero Resistance Ammeter (ZRA), Electrochemical Noise Measurement (ENM), Electrochemical Impedance Spectroscopy (EIS), Harmonic Analysis, Potentiodynamic and galvanodynamic sweeps. Roemex have also recently purchased localised corrosion monitoring software which is an interesting and useful addition to the range of screening that can be carried out. This versatile equipment permits up to 24 tests to be carried out simultaneously under different conditions and using the same or a combination of techniques. Linear Polarisation Resistance (LPR) is a commonly used technique carried out as a rapid screening technique on a large number of inhibitors before submitting for further test work. There is capability for conducting tests under sweet or sour conditions and at temperatures up to 95°C. Partitioning evaluations can also be c arried out using the LPR equipment. Roemex have Pine Instruments Rotating Cylinder Electrodes which are used to evaluate the persistency of corrosion inhibitors against high shear conditions similar to those experienced in the field. RCE allows Roemex to rapidly evaluate the effect of flow on the performance of candidate products, as they will attain turbulent flow at low Reynolds numbers. 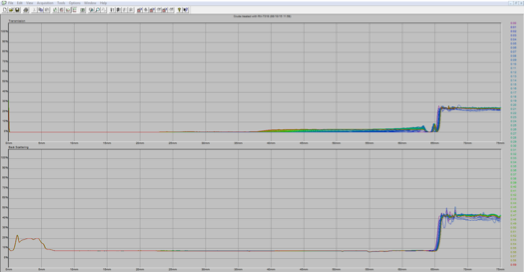 The RCE can simulate flow shear stress values of up to 250 Pa shear stress values. Again these RCE’s are controlled via the ACM equipment. One of the 12 channel ACM units which Roemex have in the Aberdeen laboratory is a weld tester. This equipment allows the screening of inhibitors against actual weld samples to evaluate any preferential corrosion in sections of the weld. This is carried out by running Long term weld LPR sweep, long term weld galvanic measurement and long term weld potential measurement. Traditionally studies of localised corrosion have been carried out using coupon tests. The problem with these tests is that it takes a long time for you to see the results from your experiment, making it a slow screening tool. The LCM technique has the ability to supply information relating to Localised Corrosion Monitoring in the initiation phase, both in terms of magnitude, an indication of the total depth of penetration as well as the general corrosion rate. The LCM technique looks for negative going transients in the potential data caused by localised events such as a pitting initiation process. These are converted into a quantity of Coulombs via a calibrating polarisation and a V/I transient calibration curve. Even in situations where localised corrosion is beyond the initiation stage, higher than expected values from the general corrosion rate will tell the user that something is not acceptable. This tool makes chemical screening faster when assessing chemicals against localised corrosion; which is a major problem experienced by a number of operators. Roemex regularly conduct static weight loss coupon tests; both on standard materials during the initial development stage and also on more specialised materials which have been specified or supplied by clients. Using high temperature equipment Roemex have the capability for conducting tests in house at temperatures up to 200°C. To facilitate effective corrosion management in the field Roemex own and utilise a Corrosion Sidestream unit and Ceion high resolution metal loss technology. Field fluids are fed through the sidestream, which houses the Ceion probe. This is connected to the data logger. As the Ceion probe, data logger and Hand Held Unit (HHU) are intrinsically safe they can be used in the field and the data extracted at intervals for review. Weight loss readings and fluid temperatures are recorded at intervals, which are set manually for optimum flexibility. The data is then uploaded to the HHU, which can then be attached to a PC and the results viewed. The injection rate can then be varied and the results recorded. This allows optimum injection rates to be determined prior to full field application. Roemex perform routine analysis of produced waters for residual levels of corrosion inhibitors utilising a Pharo spectrophotometer and colorimetric techniques. Calcium carbonate usually originates from the nature of the reservoir itself or has been stimulated by the co-mingling of produced fluids from two or more different producing zones or reservoirs. This scale is normally formed when there is a decrease in pressure, releasing carbon dioxide and changing the pH. The main mitigation strategies are dissolution by acidification or application of calcium carbonate scale inhibitor. In general barium sulfate scale results from water incompatibility, primarily from either seawater injection and / or seawater breakthrough, co-mingling with produced water rich in barium. Barium sulfate is highly insoluble and will deposit at temperature drops across the production processing plant. Mitigation strategies include the removal of sulfate ions from seawater for re-injection, application of barium sulfate scale inhibitors or treatment with specialist dissolvers. Iron Sulfide scale is deposited where microbial enhanced corrosion has become a serious problem. The scale is derived from the reaction of iron oxide from corrosion and hydrogen sulfide, a by-product of sulfate reducing bacteria metabolism. Treatment for iron sulfide is application of a specialist chelating and dissolution agent followed by microbial control with biocide application. Calcium Sulfate scale is relatively soluble and only poses a real problem when conditions are close to the solubility limit and super-saturation occurs. Roemex can supply a wide range of both scale inhibition and scale dissolving chemicals. Roemex prefer to carry out in-house laboratory testing, which includes jar tests and dynamic scale loop testing to develop a product specific to a client’s operational requirements. The photo below shows an injection point on an installation in the North Sea. 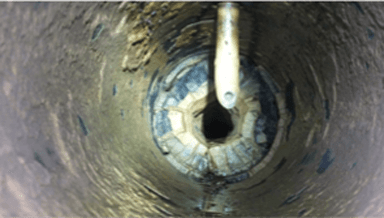 Before the injection point, serious restriction in pipe diameter as occurred. After the injection point the degree of scaling is drastically reduced showing how effective RX-6034 is at mitigating mixed sulfate and carbonate scale. The dynamic scaling loop is designed to give Roemex the capability of modelling scale deposition at high temperatures and high pressures. Preheated brines with a tendency to form scales are mixed together in a 1mm or 0.5mm ID capillary coil, which is heated to the desired temperature. The system and coil pressures are recorded using data logging software. Chemical efficiency is relative to the degree of pressure rise; i.e. scale deposition in the capillary coil. Effective scale inhibitors will prevent or delay the crystallisation of mineral scale deposits and in turn will maintain low pressures throughout the rig. This equipment allows scale inhibitor efficiency under reservoir conditions to be evaluated and also facilitates studies on HPHT well treatments. Chemical stability at temperature for squeeze and gas-lift applications is always a concern and with this equipment Roemex can perform efficiency tests on products to determine their thermal stability under reservoir conditions. Two incompatible waters with the tendency to form scale are combined in a glass bottle, heated and any scale precipitated is observed. This test is primarily qualitative and gives an indication of which products are working under the scaling regime in test. The results act only as a primary selection process for removing chemicals with intolerance to the brine and those that give no protection. The test can be made quantitative by weighing the mass of scale precipitated, however a more effective means of quantifying scale inhibitor efficiency is to calculate scaling ion concentrations after any scale has formed. Roemex recommend the testing of all products under static and dynamic conditions to obtain a product recommendation because the Dynamic scaling loop favours calcium carbonate formation over short timescales whereas the static jar test favours sulfate scaling over extended timescales. Roemex uses the OLI Studio (previously known as ScaleChem) software package to evaluate potential and risk of different types of scale. This software allows us to quantify the likelihood and degree of scaling problems under different pressure and temperature conditions and also allows us to determine difficulties that are likely to be encountered on seawater breakthrough or when produced water streams are redirected to alternative lines, storage tanks or separators. ScaleChem software also allows us to consider the effects of changing pH and the effect of mixed phases and changes in gas composition and GOR/GLR, allowing us to scale potential at all stages of production and transport provided that appropriate data is supplied. Regarding squeeze inhibitor testing, Roemex currently sub-contracts core flood work. On a quarterly basis Roemex harvest water samples from throughout the production system for 12-ion analysis at an external accredited laboratory. The data is used to build a scale prediction map and highlight the areas at most risk of scale deposition. These samples are included in the work-scope of the regular service visits to be carried out by a Roemex Engineer/Chemist. Scale inhibitor residuals can either be performed using the Hyamine method or using an HPLC fitted with a suitable detector. Roemex regularly performs this work for existing clients. The waxes present in most crude oils include n-alkanes, iso-alkanes, alkyl cyclic compounds and alkyl aromatics. In most crude n-Alkanes are the predominant species. The amount and distribution of these n-Alkanes is crude specific. Short-branched chains are the next most common. These have a significant impact on wax deposition characteristics. There is no standard definition for wax content but it is generally accepted that n-alkanes from C18 to C40 represent waxy material. Paraffin solubility not only depends on the composition of the crude but also the temperature and pressure. The wax appearance temperature (WAT) is the temperature at which, on a cooling cycle, the crude oil first precipitates solid wax. This is arguably the single most important characteristic in examining wax deposition potential in crude oil. The deposition of wax leads to several problems in reduced production and impaired flow assurance. Severe deposition can lead to loss of production and pipeline blockage etc. Pigging – A cleaning PIG launched into a pipe to mechanically scrape wax from the pipewall and distribute it within the crude in front of the PIG. Thermal Techniques – if the temperature of the oil can be maintained or increased above the Wax Appearance Temperature (WAT) e.g. by increasing the flow rate the wax deposits will either not be laid down or will be softened and removed. Chemical Solvents and Dissolvers – a wide range of solvents are available, the most popular being substituted aromatics (HAN etc.) blended with gas oil. Chlorinated solvents are now precluded from use due to environmental concerns. A preferred and unique product to Roemex is RX-7492, a proprietary blend with good environmental characteristics and excellent wax dispersion and dissolution properties. The CSPDC allows dynamic wax deposition data to be obtained from a stabilised crude oil sample. The equipment is designed to mimic the transport of crude oil through a pipe. The shear rate experienced by the oil flowing through the pipe is calculated and applied to the crude oil which is heated to the bulk crude oil temperature. A cold finger is immersed in the crude oil and wax deposits on this surface. The equipment allows strict control of shear rates applied to the cold surface and accurate control of the temperature differential between the bulk oil and the cold surface. The equipment enables profiling of the wax deposition rate with reducing temperature to be determined in the laboratory and applied to full-scale pipelines. The technology is extremely reliable, producing wax that is very similar in composition to the wax deposits formed in the field and is our most efficient tool for evaluating products under field conditions. The wax deposition flow loop is regarded as an industry standard and consists of a peristaltic pump, which feeds heated crude oil through a capillary coil. The coil is immersed in a cryogenic bath at an appropriate temperature (usually 4°C) to promote the precipitation of paraffin wax in the coil. The coil is attached to a pressure transducer, which records the pressure increase in the coil as the paraffin begins to deposit. Results are captured using data logging software. Inhibitor or dispersant efficiency is related to the degree by which pressure rises are suppressed; this is therefore the index to the efficiency by which paraffin deposition is inhibited. The Haake Viscotester 550 is used to measure the viscosity and flow behaviour of crude oils and is particularly useful in characterising the effectiveness of Pour Point Depressants (PPDs) and wax inhibitors over the temperature profile of a given pipeline. The dynamic viscometer is an extremely versatile instrument giving information on viscosity, shear stress, shear rate and yield point of crude oils and chemical additives. It allows the screening of many Roemex products at different doses quickly, using relatively small volumes of oil. Pour point tests at Roemex are based on ASTM D5853. We have made a couple of modifications to the test which are outlined in LWI-RX16. Modifications to the procedure were necessary to account for the fact that the ASTM procedure is not designed to be used for pour point depressant evaluations; it is the pour point test to be used when assaying crude oils. Roemex does not carry out this work in-house but sub-contracts it to a commercial laboratory. Normally WAT is determined by Differential Scanning Calorimetry but can also be performed by microscopy if photographs of crystal structure are required. Asphaltenes commonly occur through mixing incompatible hydrocarbon streams or in production tubing as the fluids reach the bubble point. There are several techniques available to us when evaluating asphaltene deposition. The first, SARA analysis, is an Iatroscan method that determines the relative concentrations of Saturates, Aromatics, Resins and Aliphatics in a crude oil sample. From this ratio, it is possible to calculate the colloidal instability index (CII) of a crude oil, which is an indication of the oil’s tendency to flocculate asphaltenes. Roemex do not perform this in-house but send the analysis to a local laboratory. Asphaltene inhibitor performance is evaluated at Roemex using a Turbiscan. In this test, a tube containing crude oil mixed with a light n-alkane is scaled along its length using an LED scanner which determines transmission and back scattering of the light. The apparatus can be used both in static and kinetic mode and can detect and quantify particle migration in colloidal systems. The Turbiscan software handles data acquisition and provides results, which can be graphed as % transmission against time. Samples of asphaltenic crude oil treated with dispersant are mixed with n-alkane (which causes asphaltene flocculation) and analysed. High levels of light transmission indicate that the asphaltenes have flocculated and settled out to the bottom of the tube. Low transmission indicates that the asphaltene flocs remain dispersed. The Turbiscan equipment is reliable and compact enough that it can be transported to the field if necessary. Roemex can offer a selection of Asphaltene Inhibitors such as RX-7304 for continuous injection and asphaltene dissolvers such as RX-7020. All water-bearing systems have the potential for microbial contamination. In general, biocides are applied to oilfield systems to control microbially induced corrosion (MIC) and alleviate the problems associated with by-products from bacterial respiration e.g. poisonous gases, inorganic and organic acids, slime and scales such as iron sulfide. Bacteria can survive as planktonic bacteria suspended in solution or as dispersed colonies or in sessile form (biofilms attached to a surface). Microbially Influenced Corrosion (MIC) by cathodic depolarisation of metal surfaces resulting in removal of the atomic hydrogen layer and the formation of localised pitting. Sulfate reducing bacteria produce hydrogen sulfide as a by-product of their metabolism which poses a significant risk to health and safety and can result in the formation of iron sulfide (pyrophoric scale) deposits. Due to their metabolic requirement for sulfate, SRB are commonly found in water injection systems (downstream of de-aeration), production systems with seawater breakthrough and crude oil / water storage vessels. These are also implicated in the corrosion process as they metabolically secrete organic and inorganic acids which can become trapped under bacterial biofilms and promote corrosion by the removal of the passivating oxide film. These have the potential to produce large volumes of exopolymer ideal for biofilm formation. Slime production can result in fouling and blocking of filters, lines and injection pores. Slime forming bacteria create oxygen concentration cells that can lead to under deposit corrosion and promote an ideal environment for SRB growth. Roemex can perform microbiological testing to determine the presence of different bacterial types using test kits such as Rapidchek II and Serial Dilution using modified Postgate’s medium. Roemex can also evaluate the efficiency of biocides against different planktonic and sessile bacterial populations (single or field isolated). Roemex is able to supply a most commonly used oilfield biocides which can be deployed by batch or continuous treatment. RX-5102D is our best-selling gas phase scavenger; RX-5102D efficiently reduces and controls H2S levels in production systems. This scavenger can be applied continuously to gas process streams to efficiently reduce H2S levels in gas to the required specification for export. RX-5102D has been used on several gas / oil producing installations throughout the North Sea Sector and has provided a cost-effective treatment regime to our clients. For gas streams, RX-5102D is typically injected on a continuous basis upstream of the gas dehydration system. To ensure efficient injection, RX-5102D should be injected in to the gas stream via an atomiser so that a good spray pattern is provided. Field experience has shown that injecting RX-5102D into the gas stream at a ratio of between 3 - 10 parts RX-5102D to 1 part H2S will reduce H2S levels dramatically. The efficiency of RX-5102D will depend on several factors including gas temperature, velocity, moisture levels and residence time and the dose rate must therefore be optimised in the field. RX-5102D is typically initially injected at a ratio of 10:1 into the gas phase. RX-5105 is based on aldehyde chemistry with the added benefit of being non-toxic and non-hazardous for transport. It is highly efficient at fluid phase H2S scavenging from both dynamic and static situations. RX-5105 is has an excellent environmental profile GOLD Charm banding and is readily biodegradable. RX-5105 is an acidic solution, which eliminates high pH scaling issues or emulsion forming tendencies which are found to be a problematic side effect with traditional triazine based products. RX-5105 can be used in situations where H2S is present in gas and fluids requiring to be scavenged prior to separation in order to meet pipeline specifications. RX-5105 can also be applied to static fluids that are heavily contaminated with H2S. The efficiency of RX-5105 scavenging is dependent on residence time and mixing achieved. RX-5105 is generally recommended for use at 10-20 kg of product per Kg of H2S however this can vary depending upon the levels of H2S present, temperature, residence time, pH of the aqueous medium and the concentration level of RX-5105 deployed. The injection rate should be optimised in the field. Roemex can also provide oxygen scavengers for water injection and other applications. Most commonly used is RX-202 which is a sulfite based scavenger but we can also supply non-sulfite based oxygen scavengers. Roemex has an extensive track record with supplying chemicals for the removal of oilfield deposits. The first stage in recommending a dissolver for deposit remover is to determine the composition of the deposit. Normally we would perform some basic tests on receiving the deposit to determine its nature and more complex deposits are sent out to a commercial laboratory for further ion analysis. Roemex can characterise generic solid types by their solubility and can provide indications as to the form of solid materials. For more in-depth analysis of solids such as scales, Roemex work with Aberdeen-based analytical companies to obtain x-ray diffraction (XRD) and scanning electron microscopy (SEM) data. Roemex has a number of novel non-petroleum derived wax dissolvers. These are selected and evaluated using a simple immersion wax dissolver test which can also be applied to other organic deposits. With most dissolver treatments, we recommend batch treatment, soaking the affected area with dissolver with a small amount of agitation or movement at the same time. We understand that this is difficult to achieve in many situations and we have had good success with dosing our inhibitors into produced fluids. Roemex representatives can give more guidance on the best deployment technique.